Do you ever get an itching to paint something? I do. A lot. 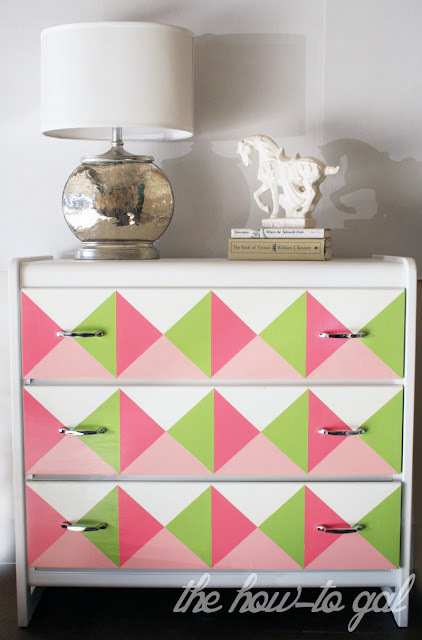 I've wanted to do a dresser re-do for a long time, but could never find the right piece. You know, something that didn't cost too much (I was going to paint it after all) but had clean lines. Well, long story short, I mentioned something about my dilemma to a good friend and she immediately perked up, "I have a dresser you can totally paint!" She took me upstairs to her little girl's room and there it was, a plain, white dresser. THE white dresser. The one I had been waiting for. Clean lines, blank canvas, light bulb moment. 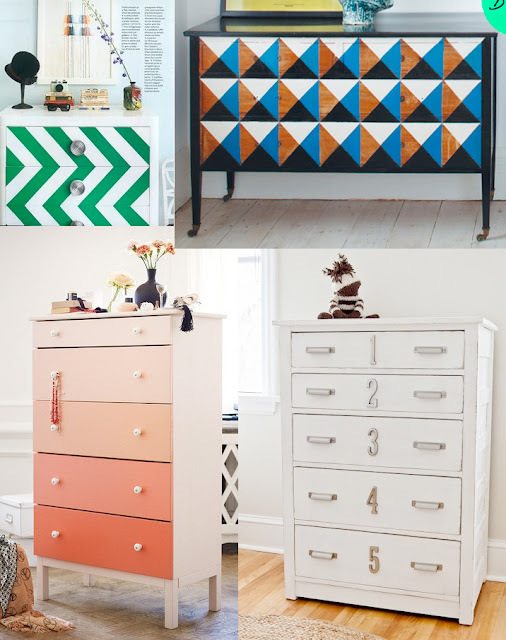 I went right home and made this idea board of some fantastic dresser makeovers I had pinned to Pinterest. I asked her to pick her favorite and I would do it for her. She chose my favorite, the geometric dresser in the upper right hand corner. I absolutely love it. We chose girly colors that will go beautifully in one lucky little girl's bedroom. Prepping a project like this is 100% CRUCIAL to having a fantastic outcome. First things first, I lightly sanded down the dresser with 3M Advanced Abrasives , removing the shiny finish, scuff marks and pen marks. Then, I gave the whole thing (except the drawers) a few coats of glossy, white paint. I also didn't sand down the drawers (more on this later). Then, I got down to business. The business of making perfectly square, squares. Measure your dresser drawer from top to bottom and across. Let's pretend this giant black rectangle is my drawer. Because it is 5 inches down and 15 inches across, you can make 3 perfect squares out of it. My actual drawer didn't have perfect measurements like this, so I had to add a little extra on each end to split it into 4 even squares. But you get the idea. Make pencil marks every 5 inches (or whatever your drawer's height measurement is). Remember, you may have to add a little on each square to evenly divide your drawer. 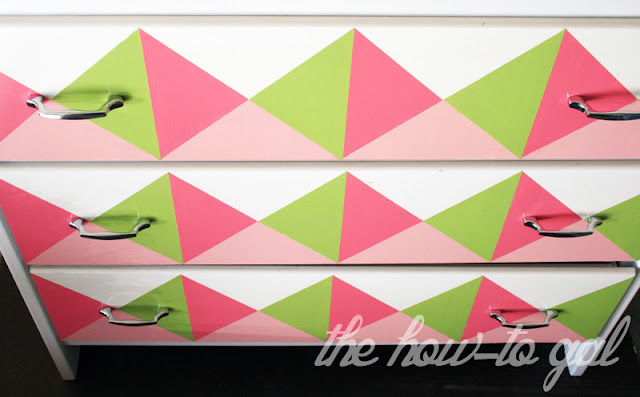 Then, pick a triangle you want to start with and start taping off your drawer. This example shows us starting with the bottom triangle. 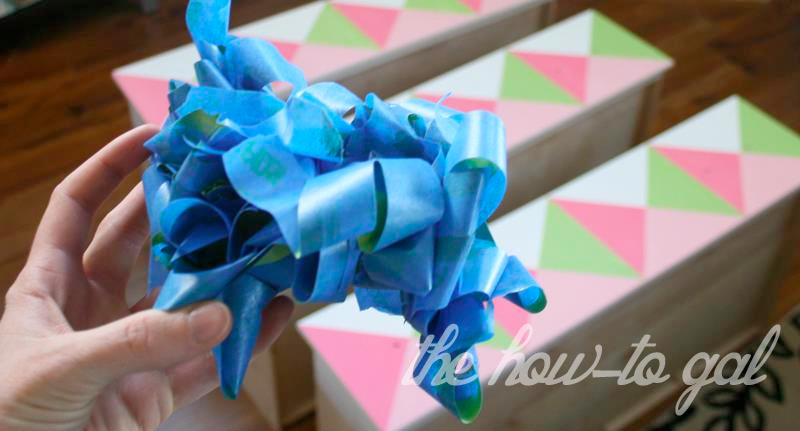 Notice how the tape moves to fully outline a specific triangle while covering up some of another. 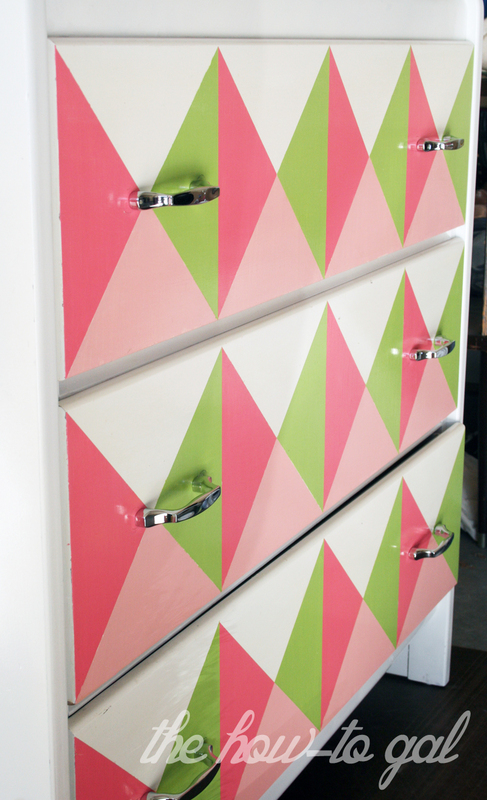 I did one triangle at a time on each drawer. It was faster this way since I didn't have to switch back and forth between paint colors. After each triangle was dry, I carefully peeled off the tape and started outlining the next triangle. Also, because I didn't sand down the dresser drawers beforehand (wanted to keep the original white, glossy finish on the one white triangle), I lightly sanded each triangle after it was taped off so the paint would stick better. I recommend using ScotchBlue Painter's Tape for perfectly crisp lines. 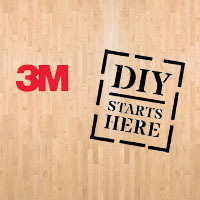 Most painter's tapes suggest removing before the paint is dry to get a crisp line. But because I needed to apply several coats of paint, I couldn't remove the tape until the triangles were dry. ScotchBlue Painter's Tape let me finish painting all of one specific triangle without worrying about peeling paint. 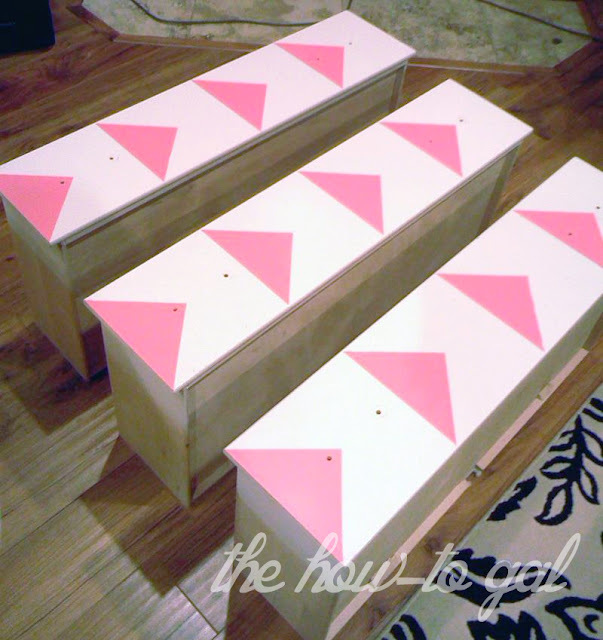 When I had finished painting all of the triangles, I let them dry an additional day before applying two coats of polyurethane. I then installed new, shiny handles for a finishing touch. I naively told my friend that I'd finish painting this dresser over the weekend. Two weeks later...I finally finished it. This project is not for the faint of heart, but totally worth it. This dresser turned out great. You have a very luck friend.